Breakfast – Is it the most important meal of the day? Do you eat breakfast every morning or do you rush out the door and grab a coffee on your way to work. When I was growing up I was told breakfast was the most important meal of the day but is that really the case or is it just a nutrition myth? Recent studies found that eating breakfast has no direct impact on weight loss and that breakfast is not the most important meal of the day. But neither is any other meal. Scientists found that eating breakfast early in the morning and your last meal late in the evening results in more fat storage and leads to health problems such as diabetes and liver disease. Scientists have found that the body does a better job of breaking down fat, sugars and cholesterol if the number of hours you have to eat are reduced. 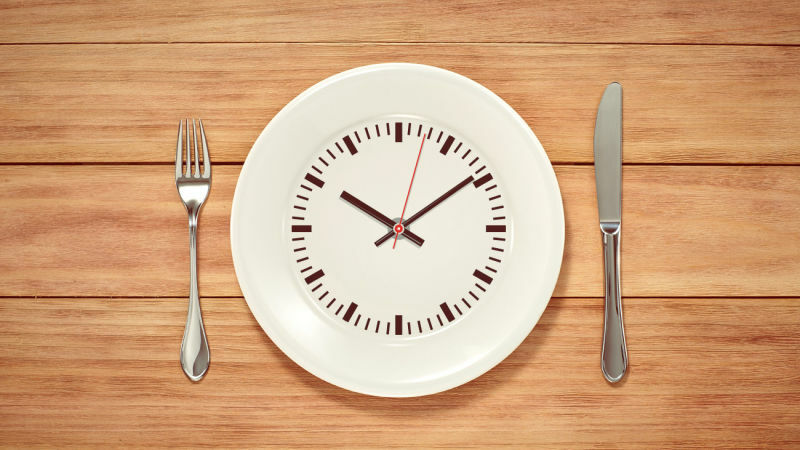 Two of my friends are fans of Intermittent Fasting (IF). For those of you who don’t know what IF is let me explain a little bit for you. IF is not a type of diet but is more a pattern of eating that allows you have periods of fasting and non-fasting. IF can be used with calorie restriction for weight loss. So instead of having a meal first thing in the morning (breakfast) try and push any intake of food to mid day so you will have a longer period of fasting. This is repeated 2 to 3 times a week. Basically you are reducing your food window by starting to eat later in the day. You also need to stop eating late in the evening so the perfect IF would be 12 noon to 7pm. The belief is that with IF your insulin sensitivity is higher when the energy stores in your body are depleted so the longer you leave it to eat after you get up in the morning, your body turns into a fat-burning, muscle-building machine. I like the sound of a fat-burning, muscle building machine but I don’t think I could go without my breakfast. Maybe I should try IF for week and see if it makes a difference. I believe eating sensibly throughout the day is the key to weight loss. A quick bowl of cereal with two tablespoons of sugar rushing out the door or grabbing a tasty muffin or sausage roll with a coffee on the way to work is not a sensible breakfast. If you start your day like this and want to loose weight then you’re going to have to change. The benefit of any meal depends on what you eat. I can’t leave the house without a healthy breakfast. Like preparing my clothes the night before, I plan my breakfast before heading to bed. I make my overnight oats or chia seeds and protein pudding that is ready to eat straight from the fridge. I have a shot of wheatgrass, some fish oil capsules, black coffee and I’m good to go. Some mornings I have poached eggs, avocado and turkey rashers. I love having protein pancakes served with 0% Greek yogurt and strawberries. These take a little bit of time so I keep them for the lazy weekend mornings. Mornings that I need to be in work early I make a smoothie and take it with me. For those of you who follow me on snap chat you will know I love a smoothie. Spinach, almond milk, chia seeds, frozen berries and sometimes half a banana to sweeten it and out the door. There are lots and lots of healthy breakfasts that will keep the weight off and will help you avoid snacking or reaching for the scone mid morning. Loosing weight is not easy. Remember to write down everything you eat and take care how you cook it. Enjoy what you eat but ask yourself do you need to eat everything on the plate. Most importantly drink lots of water throughout the day. Breakfast Bars- Say no to breakfast bars. The tasty ones are full of sugar and wont fill you up for long. Preparation – Don’t go to bed without knowing what you are going to eat for breakfast. Fruit juice – Some of the shop bought juices are very high in sugar. Have a glass of water or squeeze your own oranges instead. Coffee – Swap the Cappuccino for an Americano – huge difference in calories. Eggs – Eggs are a great source of Protein and the best way to start your day. Cook them poached, scrambled or boiled. Cereal – If you eat cereal everyday try and reduce the number of days to 3 days or less, use low fat milk, cut out the sugar and don’t be tempted to have a second bowl. Smoothie – A great healthy option and you can pack so much into one drink including spinach, berries, avocado, banana. Lots of recipes to choose from and will definitely keep you full until lunch and you can take it with you heading out the door. Bread – Avoid white bread at all times. If you really want a slice for your breakfast eat wholegrain bread. I hope some of these tips will help you change bad habits and set you off for the day feeling fuller for longer. Remember if you eat a high protein breakfast you won’t need to snack before lunch and this will result in keeping the weight off. I used to do so much of the above…juices, Smoothies & not eating til.later in the morning….it worked so we’ll for me for many years…now I’m eating breakfast but whatever has happened to my brain I just can’t stop eating at night…I got swayed by cereal in morning with berries ect but I think I need to get back to what worked for me…it might help my frame of mind at moment! Míle buíochas for your great posts Elaine….